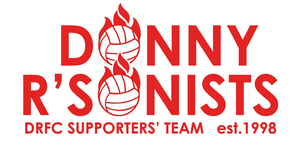 Welcome to the website of the Doncaster Rovers Internet Supporters' Football Team the Donny R'sonists. The team was formed in 1998 by the supporters who had fought so tirelessly against the regime of ex Rovers 'benefactor' Ken Richardson as the club they supported tumbled toward the abyss. With Rovers relegated and seemingly set to fold, the supporters entered a team into the IFA's annual WorldNET competition as a last hurrah. They took their name in a nod to the known antics of Richardson, had a picture of Manager Mark Weaver (labelled as W*@#ER) on their shirts, and kicked off their opening match with a pantomime horse up front. Despite supporters' worst fears Rovers survived the Summer and began the 1998-99 season without the notorious Ken and Mark double act. As such the supporters' team continued and the R'sonists remain active today as a 'lest we forget' reminder of where Rovers once were.